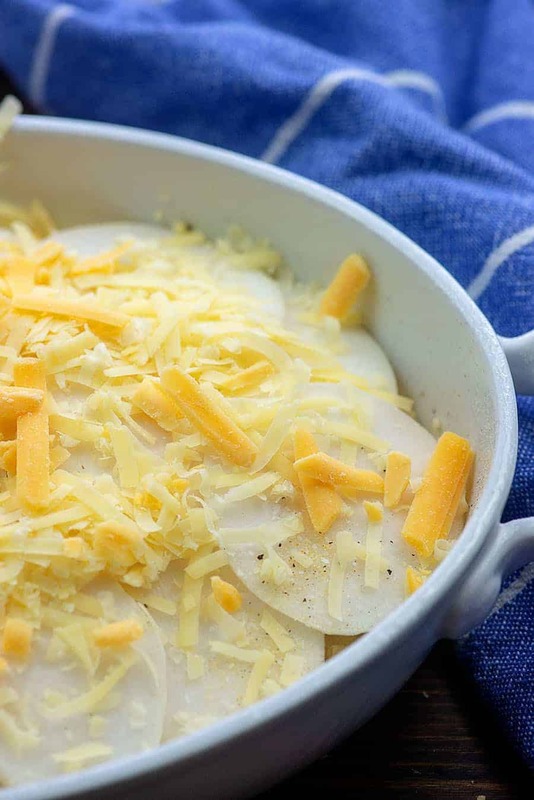 Cheesy baked turnips make a great low carb alternative to potatoes! This dish is perfect for serving up at holiday dinners and it’s simple to prepare. Holiday dinners can be such a struggle when it comes to low carb. I host my family every year and that definitely helps, because I can sprinkle plenty of low carb dishes throughout the dinner while also keeping the rest of the family happy with more traditional choices. 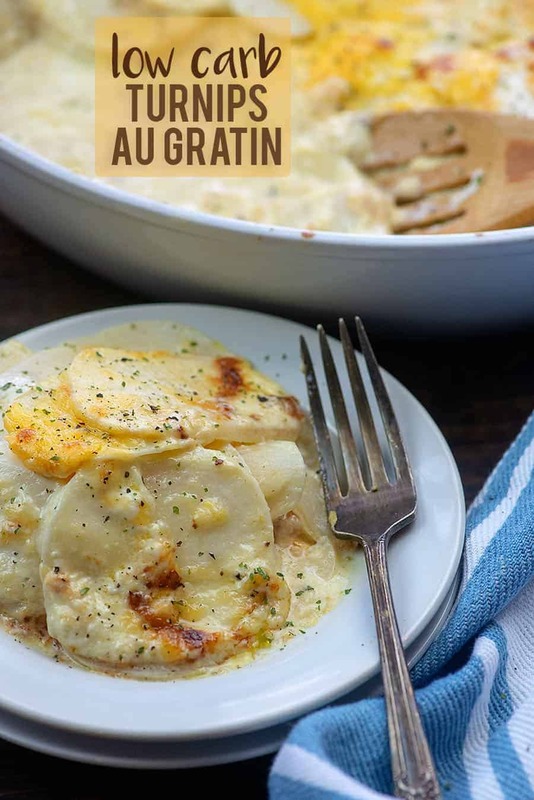 This year, I’m planning on serving these turnips au gratin along with my keto coleslaw and balsamic Brussels sprouts. Younger, smaller turnips tend to be somewhat sweet, while older, larger turnips are more bitter. The best way to decide if you like the taste of turnips is to just try them! I would suggest trying my roasted turnips to see how you feel about them – they are similar to potatoes when cooked in that manner. Even the smaller turnips have more bitterness than a potato does, though. Don’t expect these to fool anyone. They’re not potatoes! But they are delicious in their own way! To start, you’ll want to peel your turnips and then slice them very thinly. I used my food processor for this, but you could also use a mandoline or a very sharp knife. Be careful to cut the turnips the same width so that they cook evenly. Next, layer 1/3 of the turnip slices in the bottom of a baking dish. Sprinkle with seasoning, top with some cheese, and then repeat the layers. When you’ve used all the turnips and cheese, pour a bit of heavy cream over the top. You’ll want to cover the dish tightly with foil during the first part of baking. This will ensure your turnips cook through and soften up. Take the foil off and finish them off. I like to let the cheese get a bit brown and bubbly. So pretty and so delicious! Deviled Eggs with Bacon: The perfect holiday appetizer! Cauliflower Salad: Think potato salad but without the carbs! Broccoli Salad: I load mine up with cheddar, bacon, almonds, and ranch! 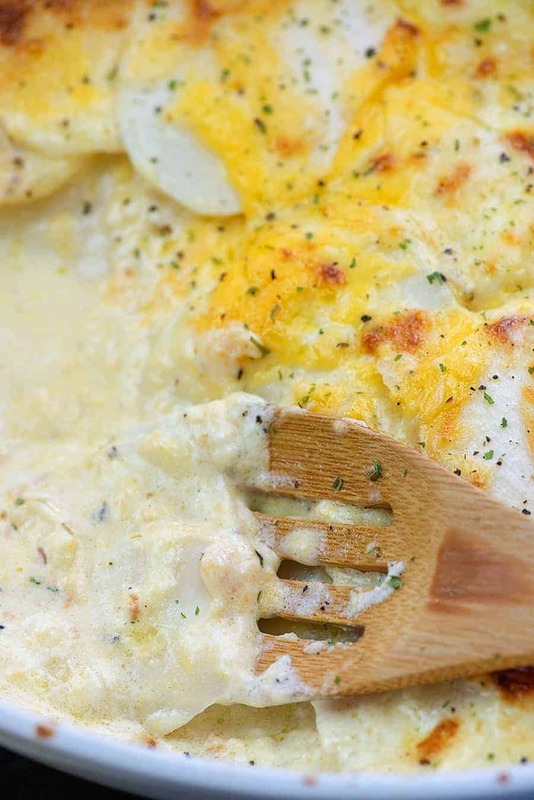 Loaded Cauliflower Casserole: Cheesy and delicious! Broccoli Cheese Casserole: The cheesiest! 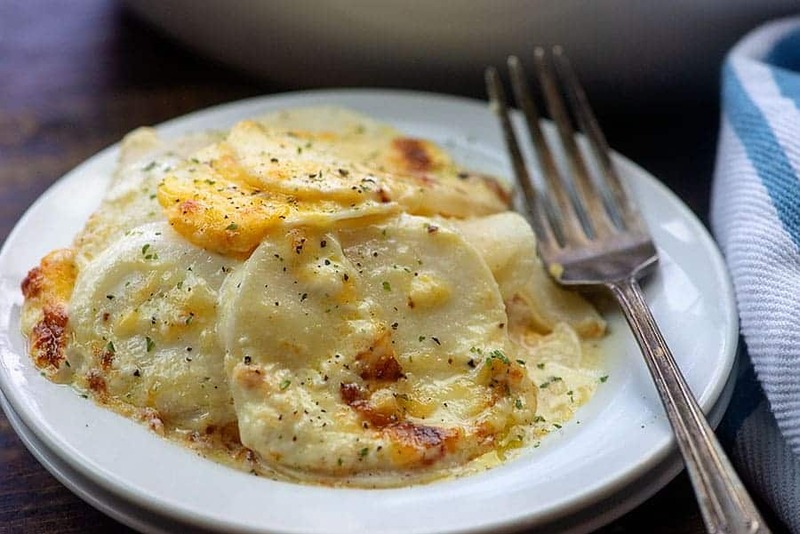 Cheesy baked turnips in a simple cream sauce. Preheat oven to 375 degrees. Butter a 9×9 baking dish. Rinse and peel the turnips. Slice turnips into 1/4 inch thick slices using a sharp knife, mandoline, or food processor. Arrange 1/3 of the turnips into the prepared baking dish. Combine the garlic powder, salt, and pepper and sprinkle the turnips with 1/3 of the seasoning. 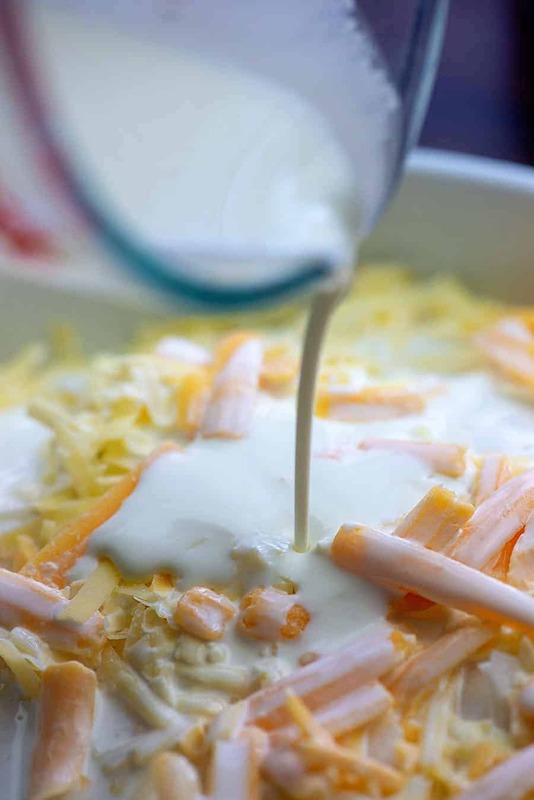 Combine the cheeses and sprinkle the turnips with 1/3 of the cheese. Repeat the layers twice more ending with cheese. Pour the cream over the top of the mixture. Cover dish tightly with foil and bake for 50 minutes. Remove the foil and continue baking for 20 minutes or until the top is lightly browned and the turnips are tender. Use the smallest turnips you can find as they'll taste less bitter than larger turnips. 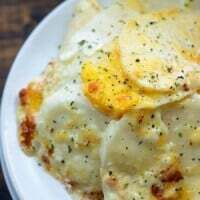 Any mix of cheese you like works well, but I find mild cheese such as Monterey Jack works well with the flavor of turnips.